Weather at the finish city of Cagliari at 2:45 PM local time: Windy! 22C (72F), fair with the wind from NNW at 42 km/hr (26 mph). No rain is forecast. The race: All 195 riders who began the race Friday started stage 3 at 1:31 PM. 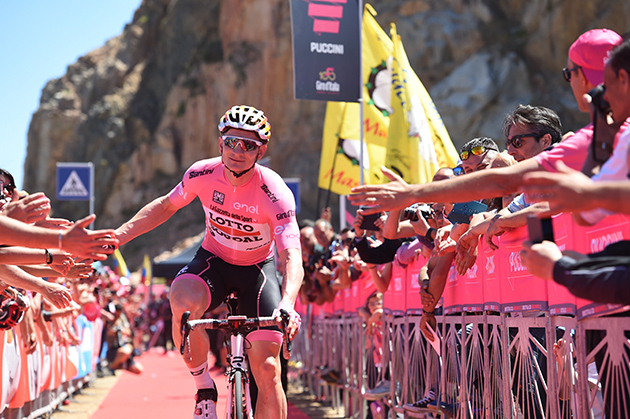 Under a clear blue sky André Greipel stood at the start of the third Giro stage, wearing the pink jersey. Just like Friday this expected sprint stage had a surprising end. 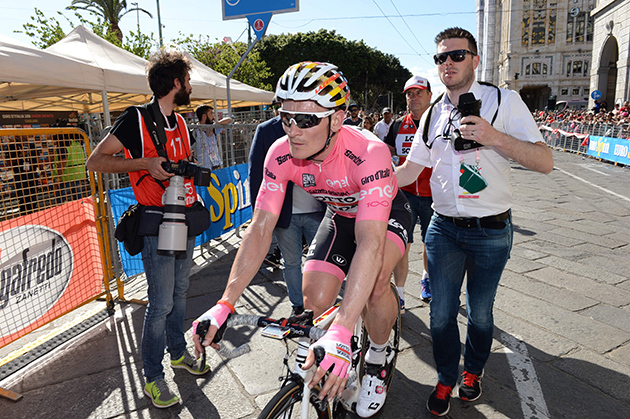 Bad luck kept André Greipel from defending the maglia rosa and winning a second stage. 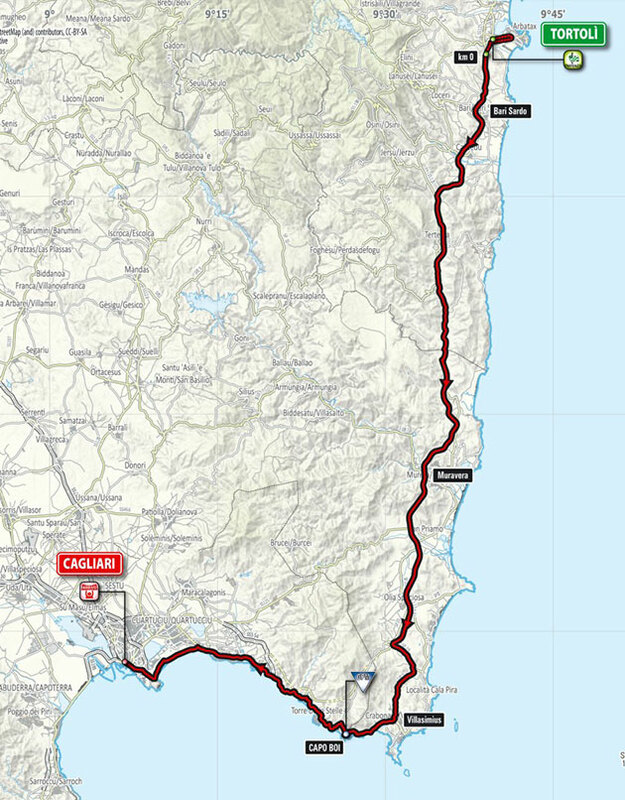 This last stage on the island Sardinia was 148 kilometres long and took the peloton from Tortolì to Cagliari. Immediately after the start four riders escaped the bunch: Tratnik, Rovny, Sbaragli and Zhupa. 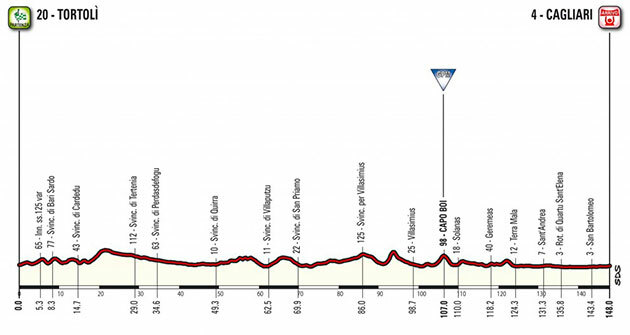 The only thing that mattered for Sbaragli was the first intermediate sprint after 35 kilometres. Afterwards he waited for the peloton. That way three leaders were left. Lotto Soudal took its responsibility. Due to the tailwind the speed was very high and the escapees never got more than three minutes advantage. 26 kilometres from the finish the breakaway was over. In the finale the course changed direction and the riders got into crosswinds. That meant a chance of echelons! All teams wanted to protect their leader which made the situation very chaotic with several teams riding next to each other at the front of the bunch. With ten kilometres to go, Quick-Step Floors created an echelon. André Greipel was very attentive and was part of that first echelon of about ten riders. But then his foot came loose from his pedal when he had to dodge another rider to avoid crashing. The German champion got distanced. Lotto Soudal tried to close the gap on the front group, but didn’t succeed. 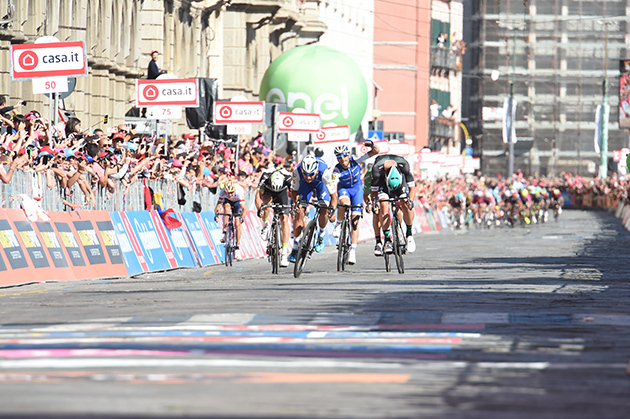 Fernando Gaviria beat Rüdiger Selig and Giacomo Nizzolo in the sprint. André Greipel finished tenth thirteen seconds later. He crossed the line as third of a small peloton. Gaviria takes over the leader’s jersey from Greipel who does maintain the points jersey. 11 BAUHAUS Phil TEAM SUNWEB s.t. 12 KUZNETSOV Viacheslav KATUSHA-ALPECIN s.t. 13 FERRARI Roberto UAE TEAM EMIRATES s.t. 14 GIBBONS Ryan DIMENSION DATA s.t. 15 KONRAD Patrick BORA-HANSGROHE s.t. 16 POSTLBERGER Lukas BORA-HANSGROHE s.t. 17 BATTAGLIN Enrico LOTTO NL-JUMBO s.t. 18 SAVITCKII Ivan GAZPROM-RUSVELO s.t. 20 ZHUPA Eugert WILIER TRIESTINA-SELLE ITALIA s.t. 21 MAESTRI Mirco BARDIANI CSF s.t. 22 KRUIJSWIJK Steven LOTTO NL-JUMBO s.t. 23 BOARO Manuele BAHRAIN-MERIDA s.t. 24 KOREN Kristijan CANNONDALE-DRAPAC s.t. 25 THOMAS Geraint SKY s.t. 26 POZZOVIVO Domenico AG2R LA MONDIALE s.t. 27 SLAGTER Tom-Jelte CANNONDALE-DRAPAC s.t. 28 NIBALI Vincenzo BAHRAIN-MERIDA s.t. 29 MOLLEMA Bauke TREK-SEGAFREDO s.t. 30 ROSA Diego SKY s.t. 32 AMADOR Andrey MOVISTAR s.t. 33 DUMOULIN Tom TEAM SUNWEB s.t. 34 PINOT Thibaut FDJ s.t. 35 QUINTANA Nairo MOVISTAR s.t. 36 SANCHEZ Luis León ASTANA s.t. 38 CAMPENAERTS Victor LOTTO NL-JUMBO s.t. 39 KELDERMAN Wilco TEAM SUNWEB s.t. 40 TANKINK Bram LOTTO NL-JUMBO s.t. 41 MÜHLBERGER Gregor BORA-HANSGROHE s.t. 42 MONTAGUTI Matteo AG2R LA MONDIALE s.t. 43 HERMANS Ben BMC s.t. 44 DE PLUS Laurens QUICK-STEP FLOORS s.t. 45 VAN GARDEREN Tejay BMC s.t. 46 QUINZIATO Manuel BMC s.t. 47 ROSSKOPF Joseph BMC s.t. 48 FARIA DA COSTA Rui Alberto UAE TEAM EMIRATES s.t. 49 FORMOLO Davide CANNONDALE-DRAPAC s.t. 50 MONFORT Maxime LOTTO SOUDAL s.t. 51 MORABITO Steve FDJ s.t. 52 ROJAS Jose MOVISTAR s.t. 53 MOHORIC Matej UAE TEAM EMIRATES s.t. 54 MARCATO Marco UAE TEAM EMIRATES s.t. 56 MARCZYNSKI Tomasz LOTTO SOUDAL s.t. 57 LUDVIGSSON Tobias FDJ s.t. 58 MEZGEC Luka ORICA-SCOTT s.t. 61 GONÇALVES José KATUSHA-ALPECIN s.t. 64 CONTI Valerio UAE TEAM EMIRATES s.t. 65 CATALDO Dario ASTANA s.t. 66 VENTOSO Francisco BMC s.t. 67 PETILLI Simone UAE TEAM EMIRATES s.t. 68 HEPBURN Michael ORICA-SCOTT s.t. 69 PATERSKI Maciej CCC SPRANDI POLKOWICE s.t. 70 PONZI Simone CCC SPRANDI POLKOWICE s.t. 71 VILLELLA Davide CANNONDALE-DRAPAC s.t. 72 GROSSCHARTNER Felix CCC SPRANDI POLKOWICE s.t. 73 HANSEN Adam LOTTO SOUDAL s.t. 74 PREIDLER Georg TEAM SUNWEB s.t. 75 MARTINELLI Davide QUICK-STEP FLOORS s.t. 76 TCATEVICH Aleksei GAZPROM-RUSVELO s.t. 77 KEISSE Iljo QUICK-STEP FLOORS s.t. 78 ROY Jérémy FDJ s.t. 79 CAPECCHI Eros QUICK-STEP FLOORS s.t. 80 MENDES José BORA-HANSGROHE s.t. 81 PELUCCHI Matteo BORA-HANSGROHE s.t. 82 HIRT Jan CCC SPRANDI POLKOWICE s.t. 83 BAK YTTING Lars LOTTO SOUDAL s.t. 84 DE BUYST Jasper LOTTO SOUDAL s.t. 85 WOODS Michael CANNONDALE-DRAPAC s.t. 86 GESCHKE Simon TEAM SUNWEB s.t. 87 SBARAGLI Kristian DIMENSION DATA s.t. 88 STUYVEN Jasper TREK-SEGAFREDO s.t. 90 DEIGNAN Philip SKY s.t. 91 GASTAUER Ben AG2R LA MONDIALE s.t. 92 KISERLOVSKI Robert KATUSHA-ALPECIN s.t. 93 GOLAS Michal SKY s.t. 94 TEN DAM Laurens TEAM SUNWEB s.t. 95 DEVENYNS Dries QUICK-STEP FLOORS s.t. 96 PUCCIO Salvatore SKY s.t. 97 BIDARD François AG2R LA MONDIALE s.t. 98 PELLIZOTTI Franco BAHRAIN-MERIDA s.t. 99 PIBERNIK Luka BAHRAIN-MERIDA s.t. 100 MARECZKO Jakub WILIER TRIESTINA-SELLE ITALIA s.t. 101 MOLARD Rudy FDJ s.t. 102 BONNET William FDJ s.t. 103 KIRYIENKA Vasil SKY s.t. 104 ANACONA Winner MOVISTAR s.t. 107 TUFT Svein ORICA-SCOTT s.t. 108 JUUL JENSEN Christopher ORICA-SCOTT s.t. 110 BARTA Jan BORA-HANSGROHE s.t. 112 KEIZER Martijn LOTTO NL-JUMBO s.t. 113 CHEVRIER Clement AG2R LA MONDIALE s.t. 114 HENAO GOMEZ Sebastian SKY s.t. 116 JAUREGUI Quentin AG2R LA MONDIALE s.t. 117 AGNOLI Valerio BAHRAIN-MERIDA s.t. 118 HOFLAND Moreno LOTTO SOUDAL s.t. 119 STETINA Peter TREK-SEGAFREDO s.t. 120 JANSE VAN RENSBURG Jacques DIMENSION DATA s.t. 121 OWSIAN Lukasz CCC SPRANDI POLKOWICE s.t. 122 HERRADA Jose MOVISTAR s.t. 123 VAN ZYL Johann DIMENSION DATA s.t. 124 ROLLAND Pierre CANNONDALE-DRAPAC s.t. 125 DIDIER Laurent TREK-SEGAFREDO s.t. 126 VAUGRENARD Benoit FDJ s.t. 127 ELISSONDE Kenny SKY s.t. 128 REICHENBACH Sébastien FDJ s.t. 129 VAN DEN BROECK Jurgen LOTTO NL-JUMBO s.t. 130 DE LA PARTE Victor MOVISTAR s.t. 131 FRAILE Omar DIMENSION DATA s.t. 132 IZAGUIRRE Gorka MOVISTAR s.t. 133 CASTELIJNS Twan LOTTO NL-JUMBO s.t. 134 PLAZA Ruben ORICA-SCOTT s.t. 135 BILBAO LOPEZ Pello ASTANA s.t. 136 BENNATI Daniele MOVISTAR s.t. 137 MAMYKIN Matvey KATUSHA-ALPECIN s.t. 138 HANSEN Jesper ASTANA s.t. 140 HAGA Chad TEAM SUNWEB s.t. 141 ZEITS Andrey ASTANA s.t. 142 DILLIER Silvan BMC s.t. 143 TEKLEHAIMANOT Daniel DIMENSION DATA s.t. 144 HOWES Alex CANNONDALE-DRAPAC s.t. 145 TEUNS Dylan BMC s.t. 147 CICCONE Giulio BARDIANI CSF s.t. 148 RODRIGUEZ MARTIN Cristian WILIER TRIESTINA-SELLE ITALIA s.t. 149 ANTON Igor DIMENSION DATA s.t. 150 VISCONTI Giovanni BAHRAIN-MERIDA s.t. 151 POZZATO Filippo WILIER TRIESTINA-SELLE ITALIA s.t. 152 SENNI Manuel BMC s.t. 153 FONZI Giuseppe WILIER TRIESTINA-SELLE ITALIA s.t. 154 CLEMENT Stef LOTTO NL-JUMBO s.t. 155 SERRY Pieter QUICK-STEP FLOORS s.t. 156 DE CLERCQ Bart LOTTO SOUDAL s.t. 157 TRATNIK Jan CCC SPRANDI POLKOWICE s.t. 158 DENNIS Rohan BMC s.t. 159 ALAFACI Eugenio TREK-SEGAFREDO s.t. 160 RAVASI Edward UAE TEAM EMIRATES s.t. 161 BERNARD Julien TREK-SEGAFREDO s.t. 162 GENIEZ Alexandre AG2R LA MONDIALE s.t. 163 HERNANDEZ Jesus TREK-SEGAFREDO s.t. 164 TIRALONGO Paolo ASTANA s.t. 165 VICIOSO Angel KATUSHA-ALPECIN s.t. 166 BENEDETTI Cesare BORA-HANSGROHE s.t. 167 LUNKE Sindre Skjøstad TEAM SUNWEB s.t. 168 BENNETT Sam BORA-HANSGROHE s.t. 169 PEDERSEN Mads TREK-SEGAFREDO s.t. 170 SUTHERLAND Rory MOVISTAR s.t. 171 DE BIE Sean LOTTO SOUDAL s.t. 172 SAMOILAU Branislau CCC SPRANDI POLKOWICE s.t. 173 MORENO BAZAN Javier BAHRAIN-MERIDA s.t. 174 BELKOV Maxim KATUSHA-ALPECIN s.t. 175 VERONA Carlos ORICA-SCOTT s.t. 176 AMEZQUETA MORENO Julen WILIER TRIESTINA-SELLE ITALIA s.t. 177 BIALOBLOCKI Marcin CCC SPRANDI POLKOWICE s.t. 178 MARTINEZ POVEDA Daniel WILIER TRIESTINA-SELLE ITALIA s.t. 179 FIRSANOV Sergey GAZPROM-RUSVELO s.t. 180 STAMSNIJDER Tom TEAM SUNWEB s.t. 181 SCHLEGEL Michal CCC SPRANDI POLKOWICE s.t. 182 KOSHEVOY Ilia WILIER TRIESTINA-SELLE ITALIA s.t. 183 FOLIFOROV Alexander GAZPROM-RUSVELO s.t. 184 LAGUTIN Sergey GAZPROM-RUSVELO s.t. 185 KOZONTCHUK Dmitriy GAZPROM-RUSVELO s.t. 186 BIZHIGITOV Zhandos ASTANA s.t. 187 DOMBROWSKI Joseph Lloyd CANNONDALE-DRAPAC s.t. 188 CARTHY Hugh CANNONDALE-DRAPAC s.t. 189 LOSADA Alberto KATUSHA-ALPECIN s.t. 190 ROVNY Ivan GAZPROM-RUSVELO s.t. 191 ANDREETTA Simone BARDIANI CSF s.t. 192 BOEM Nicola BARDIANI CSF s.t. 193 SHALUNOV Evgeny GAZPROM-RUSVELO s.t. 195 BUSATO Matteo WILIER TRIESTINA-SELLE ITALIA 06' 45"
13 YATES Adam ORICA-SCOTT s.t. 15 FARIA DA COSTA Rui Alberto UAE TEAM EMIRATES s.t. 17 QUINTANA Nairo MOVISTAR s.t. 18 KOREN Kristijan CANNONDALE-DRAPAC s.t. 19 DUMOULIN Tom TEAM SUNWEB s.t. 20 SANCHEZ Luis León ASTANA s.t. 21 MONTAGUTI Matteo AG2R LA MONDIALE s.t. 22 KONRAD Patrick BORA-HANSGROHE s.t. 24 ROJAS Jose MOVISTAR s.t. 25 ROSSKOPF Joseph BMC s.t. 26 MOLLEMA Bauke TREK-SEGAFREDO s.t. 27 VAN GARDEREN Tejay BMC s.t. 28 PINOT Thibaut FDJ s.t. 29 AMADOR Andrey MOVISTAR s.t. 30 MÜHLBERGER Gregor BORA-HANSGROHE s.t. 31 FORMOLO Davide CANNONDALE-DRAPAC s.t. 32 MONFORT Maxime LOTTO SOUDAL s.t. 33 DE PLUS Laurens QUICK-STEP FLOORS s.t. 37 KELDERMAN Wilco TEAM SUNWEB s.t. 41 SLAGTER Tom-Jelte CANNONDALE-DRAPAC s.t. 42 MOHORIC Matej UAE TEAM EMIRATES s.t. 52 PONZI Simone CCC SPRANDI POLKOWICE s.t. 53 VILLELLA Davide CANNONDALE-DRAPAC s.t. 54 PREIDLER Georg TEAM SUNWEB s.t. 55 PUCCIO Salvatore SKY s.t. 56 VENTOSO Francisco BMC s.t. 57 PETILLI Simone UAE TEAM EMIRATES s.t. 58 PIBERNIK Luka BAHRAIN-MERIDA s.t. 59 MARTINELLI Davide QUICK-STEP FLOORS s.t. 60 CONTI Valerio UAE TEAM EMIRATES s.t. 61 TCATEVICH Aleksei GAZPROM-RUSVELO s.t. 62 BIDARD François AG2R LA MONDIALE s.t. 63 DEVENYNS Dries QUICK-STEP FLOORS s.t. 64 GROSSCHARTNER Felix CCC SPRANDI POLKOWICE s.t. 65 BAK YTTING Lars LOTTO SOUDAL s.t. 68 MENDES José BORA-HANSGROHE s.t. 69 GOLAS Michal SKY s.t. 70 ANACONA Winner MOVISTAR s.t. 72 BONNET William FDJ s.t. 73 MOLARD Rudy FDJ s.t. 74 HIRT Jan CCC SPRANDI POLKOWICE s.t. 76 GESCHKE Simon TEAM SUNWEB s.t. 77 DE BUYST Jasper LOTTO SOUDAL s.t. 78 PATERSKI Maciej CCC SPRANDI POLKOWICE s.t. 79 TEN DAM Laurens TEAM SUNWEB s.t. 90 KEISSE Iljo QUICK-STEP FLOORS s.t. 92 CAPECCHI Eros QUICK-STEP FLOORS s.t. 95 BERARD Julien AG2R LA MONDIALE s.t. 96 ROLLAND Pierre CANNONDALE-DRAPAC s.t. 97 JANSE VAN RENSBURG Jacques DIMENSION DATA s.t. 98 HANSEN Jesper ASTANA s.t. 100 HEPBURN Michael ORICA-SCOTT s.t. 106 DIDIER Laurent TREK-SEGAFREDO s.t. 108 ELISSONDE Kenny SKY s.t. 112 VAUGRENARD Benoit FDJ s.t. 115 AGNOLI Valerio BAHRAIN-MERIDA s.t. 121 HERRADA Jose MOVISTAR s.t. 122 PLAZA Ruben ORICA-SCOTT s.t. 124 SAVITCKII Ivan GAZPROM-RUSVELO 04' 17"
126 LADAGNOUS Matthieu FDJ s.t. 129 BARBIN Enrico BARDIANI CSF s.t. 131 KIRYIENKA Vasil SKY s.t. 135 SCHLEGEL Michal CCC SPRANDI POLKOWICE s.t. 136 LAGUTIN Sergey GAZPROM-RUSVELO s.t. 140 POZZATO Filippo WILIER TRIESTINA-SELLE ITALIA s.t. 143 AMEZQUETA MORENO Julen WILIER TRIESTINA-SELLE ITALIA s.t. 144 MORENO BAZAN Javier BAHRAIN-MERIDA s.t. 150 TRATNIK Jan CCC SPRANDI POLKOWICE s.t. 152 TIRALONGO Paolo ASTANA s.t. 160 FIRSANOV Sergey GAZPROM-RUSVELO s.t. 162 BERNARD Julien TREK-SEGAFREDO s.t. 163 FONZI Giuseppe WILIER TRIESTINA-SELLE ITALIA s.t. 164 SAMOILAU Branislau CCC SPRANDI POLKOWICE s.t. 165 MARTINEZ POVEDA Daniel WILIER TRIESTINA-SELLE ITALIA s.t. 167 CARTHY Hugh CANNONDALE-DRAPAC s.t. 169 LUNKE Sindre Skjøstad TEAM SUNWEB s.t. 172 KOZONTCHUK Dmitriy GAZPROM-RUSVELO s.t. 173 DOMBROWSKI Joseph Lloyd CANNONDALE-DRAPAC s.t. 174 STAMSNIJDER Tom TEAM SUNWEB s.t. 175 LOSADA Alberto KATUSHA-ALPECIN s.t. 190 BIZHIGITOV Zhandos ASTANA s.t. Race leader André Greipel heads to the start line. Here they come. The front group still has a small lead. Feranando Gaviria has it won and teammate Max Richeze, who finished 5th, celebrates. 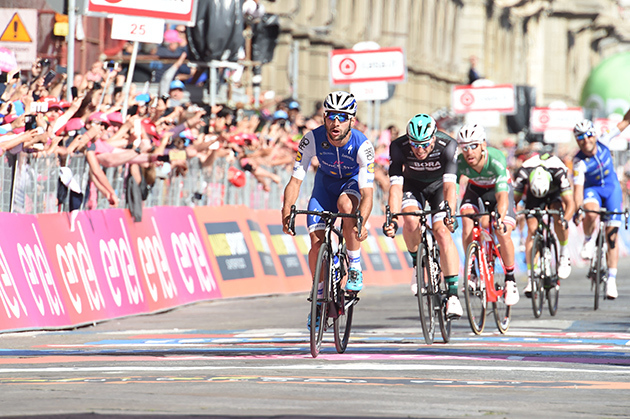 Fernando Gaviria wins stage three. 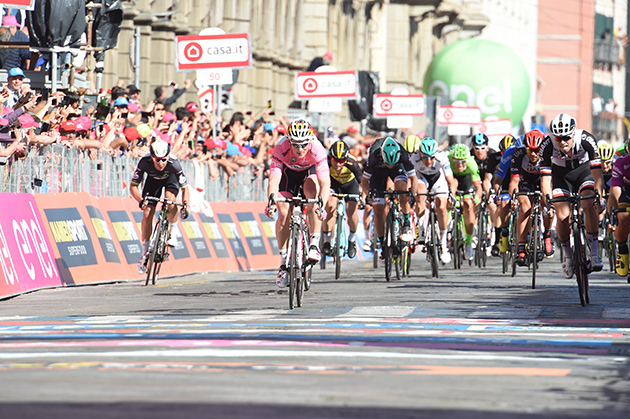 André Greipel (in pink) finished 10th. Overnight race leader André Greipel after the stage. 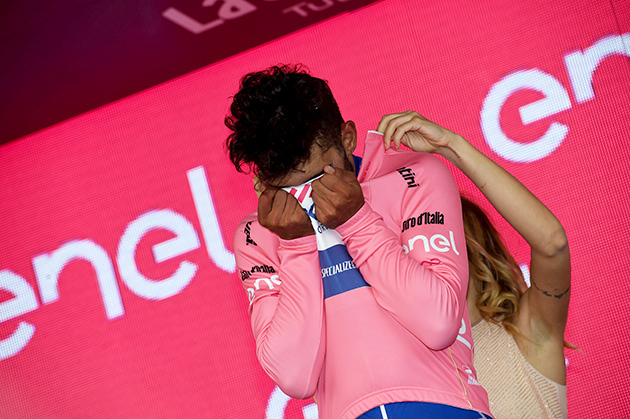 Fernando Gaviria is overcome with emotion and he's helped into the leader's pink jersey. Organizer's preview: A basically flat stage with light, easy undulating stretches throughout the course. After Villasimius the parcours features some short climbs on the coast road. 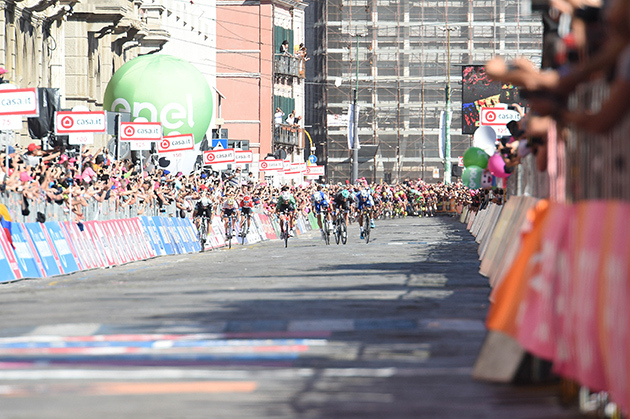 The final part leading into Cagliari runs flat: the packed bunch will sprint to the finish.